Millennial typically refers to people born between 1977 and 1997 and are in the age range of 18-37. This group, about 80M+ strong with a discretionary spending of $430B, is about 25% of the US population and larger than the Baby Boomers. The travel industry, in particular, needs to target Millennials as they are approximately 32% of all US travelers and the fastest growing age segment for travel. By 2020, Millennials will account for 50% of all business travel spending. This generation loves to travel and is 2X more likely to travel in groups and takes 2.6 trips with children. Millennials are an increasingly important market for hotel marketers and will shape the travel industry during the next few years. Traditional marketing methods don’t work as well with the Millennial generation. This generation is digitally savvy (often times more savvy than the marketers targeting them) and grew up with mobile phones, emails, and around the clock internet. If they had a choice, Millennials would engage only using digital media. This generation prizes transparency, relevancy, and authenticity of the message. They value experiences far more than previous generations and are big believers in causes such as social justice. Millennials share pictures, experiences, and opinions with friends on social media and will try and influence the opinion of others. They are 2X more likely to read reviews before they buy travel and will engage in 2-way conversations with a brand. Similar to previous generations, they are also very interested in deals. 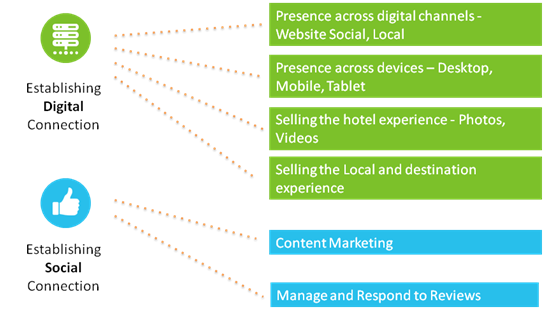 As a hotel marketer, it is important to connect to a Millennial by establishing a digital and a social connection. Having presence across all digital channels and devices, and sharing the hotel and destination experience is key to connecting with this generation. The messaging needs to be personalized to make it relevant. Use relevant content marketing opportunities and reviews to engage with Millennials on the social front. The figure below summarizes the key elements of digital and social marketing to target Millennials. To learn more about “Marketing to the Millennial Generation,” attend Milestone’s Digital Marketing Conference in Santa Clara, CA Sept 14th-15th.